Coaching is still going well. I keep telling people how happy I am with my coach. It has me very excited my races this year! Right now we are starting to work on building up speed which often involves track workouts for running. I don’t have access to a track and now that I have a new job I am super tight on time. Enter in Garmin Connect. I am sure many of you have an account there because you own some type of Garmin Device. Did you know that you can make custom workouts that will allow you to do track style workouts anywhere? This is a great FREE tool that I don’t use nearly enough! Under the Plan menu in Garmin Connect you will find an option for Workouts. From there you will get a screen that will allow you to build a custom workout. It is very easy to use. Below is a picture of the workout I created for last week. This was for 5 X 600 with 3:00 min rest between. The watch will beep at you when you start a new interval. 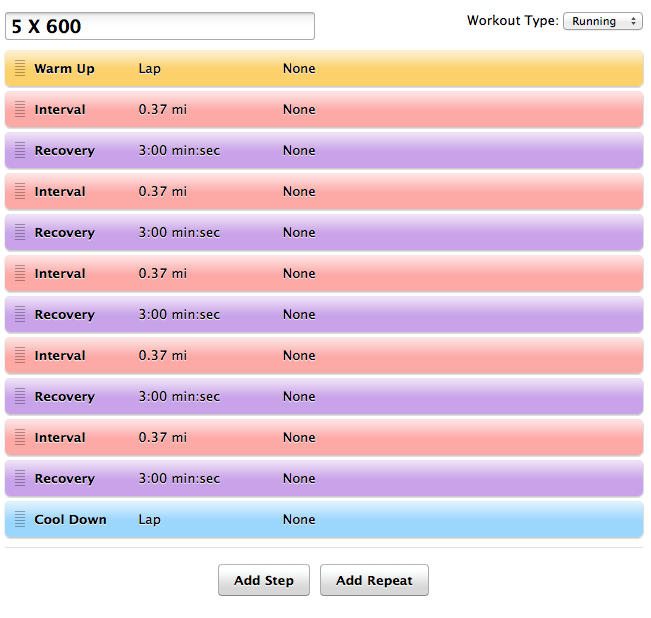 You can also set a target pace, HR or HR zone for each interval if you want. Then the watch will beep at you if you are not hitting the target. The best part of this is you can do track distance intervals anywhere! I went down to the flattest part of my neighborhood and just ran back and forth to do my intervals. The watch will automatically get your splits for each interval so you can go back later and see your results. Here are mine from this workout. As you can see I didn’t do the best job pacing myself (plus one direction was into the wind). But you get the picture. If you have a Garmin device you use for training I suggest you check out this function if you haven’t already. After you have saved your workout out you send it to your device where you can find it in the workout menu (varies from device to device). It is that simple! 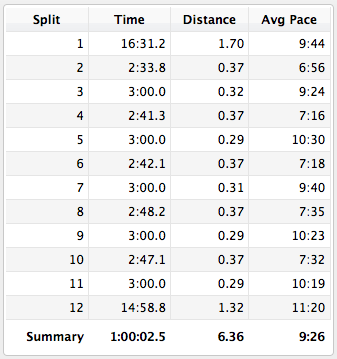 this is a gray feature even with a track…..the gps tends to throw the laps off if the workout isn’t predetermined. Structure is so much FUN!! Which Garmin are you using? 910? Yes the 910. You can do this with the 305 and 310 I am pretty sure, as well as the newer running ones like the 620.